Join us a winter bazaar and get shop for jewelry, clothes, soaps, hijabs, Islamic books, Islamic dolls, and abayas. Don’t miss this opportunity to support our local community member vendors, do a little shopping, and support your community center. Admission is free. Bring the entire family. WE ARE AT CAPACITY and we do not have additional stall space available. 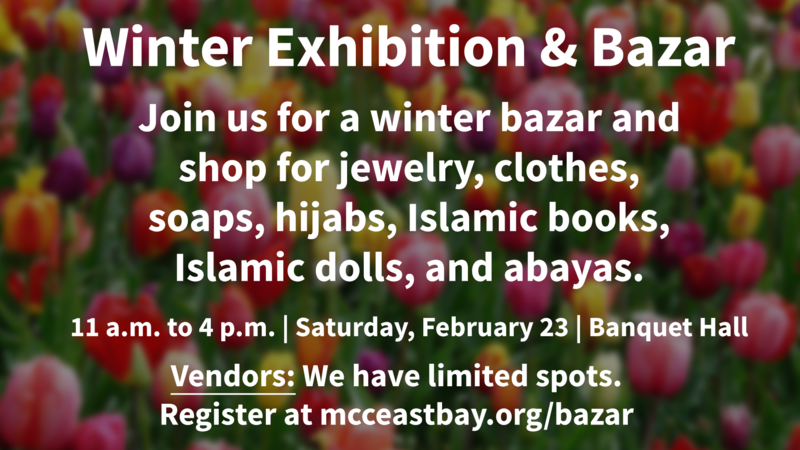 For any questions about this Bazar, please email bazar@mcceastbay.org or call Sister Shazia Ashraf at 925-640-2967.